The Indian Farmer has lived in poverty and extreme circumstances for a long time. Technology now provides a glimmer of hope and promises to grow their businesses. When farmers in northern India's Uttar Pradesh state harvested their wheat in the past, they usually had to sell to local middlemen at whatever price was offered. 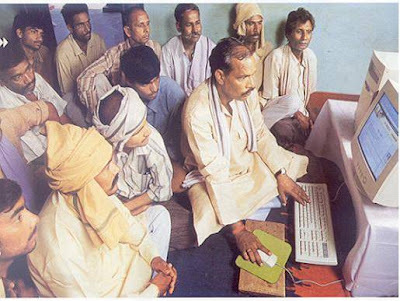 Now, thanks to the Internet, they can get higher prices for their crops.In villages in Uttar Pradesh and eight other states, farmers can go to an Internet kiosk where they have access to a network set up by the India Tobacco Company. On the network, known as e-Choupal, they can check prices and sell their crops online. A quiet revolution is taking place in the unremarkable town of Baramati. It was all very different in Baramati just a few years ago. Then, the milk was sold locally, if at all. Its recently installed computerised and automated milk collection centres are helping India retain its new-found position as the world's largest milk producer.Its 100,000 largely illiterate dairy farmers milked their few cattle by hand and struggled to get to market before the searing heat turned the milk sour. At the market, they could never be sure they would find a buyer, day after day. But cutting-edge technology used in the collection, processing and sale of milk is triggering a "white" revolution in the 150 dairy-farming villages around Baramati. IITians are helping farmers find answers to their crop problems. And they do this with SMSes.Standing in the middle of his vineyard with a laptop in hand, 30-year-old Sandeep Khode is perhaps the face of the new techno-savvy Indian farmer, who gets expert agricultural advice by posting queries online at www.aaqua.org.Eighty-four call centres across the country are answering farmers' queries related to everything from fungus on brinjals to kisan credit cards and prices of insecticides.Set up by the Department of Agriculture, under the Ministry of Agriculture, in January 2004 with an initial investment of Rs 100 crore (US$1=Rs43), the Kisan Call Centres - a single-knowledge pool catering to Indian farmers across the country - are proving a boon for the farming community. Farmers can dial the toll-free telephone number - 1551 - to get specialists, positioned at 84 call centres across the country, to answer a repertoire of questions related to agriculture and allied fields. Infosys Technologies has partnered with ACDI/VOCA, a non-profit international development organization that promotes broad-based economic growth, to develop an Information and Communication Technology (ICT)-enabled application that would improve efficiencies in the agro supply chain in India. The solution minimizes inventory requirements, reduces waste and allows retailers and farmers to be better integrated.The application also gives farmers real-time access to agricultural experts, thereby improving farming technology at an overall level. Intellicon does wonders for farmers in Rajasthan. Technology is moving ahead and so have the farmers in Rajasthan, all credit to the two-way Aethra video conferencing system. The video conferencing system has recently been installed by the Rajasthan government in Krishi Vidya Kendras (KVKs) in 10 districts.The system connects 11 locations spread across Maharana Pratap University of Agriculture & Technology in Rajasthan. The farmers are now using video conferencing to procure good quality seeds, fertilisers and for others inputs. These systems also help them access market-related information and most importantly market their products in a better way. Millions of Indian farmers will soon get district specific agro-weather advisories to boost agricultural produce and reduce losses due to the vagaries of nature. This will be done by the Indian Meteorological Department (IMD) in collaboration with agricultural universities across the country. This will cut down the error margin and benefit the farmer most. I wonder about the scale of these initiatives and hope one day all farmers will have access and use these technologies to make their business's better and more efficient.